I never had a salad spinner growing up. I thought it was kind of a silly invention. "Why do you need that? Just put your lettuce on a towel!" Little did I know. I love my salad spinner now. When we were first married I had a smaller bowl, thinking I won't be making salad for more than 2 for a few years. But when we broke it, I was glad I bought this bigger model. 1 - Have limpy lettuce? Don't throw it out! I had some spinach the other week sit in a hot car for a little too long. Just put the spinach in the spinner, fill it with cold water and stick it in the fridge for a until you are ready to eat. (This is great for fresh spinach because all the dirt goes to the bottom of the bowl. Remove the slotted bowl, dump the water, and spin the rest of the water out. It works with any lettuce. I just did it yesterday with this Romaine! PS - if you don't have a salad spinner, you can do this with really cold water in a clean sink. Or big bowl. If you don't have time to put it in the fridge, you can just do really cold water, even ice water for 10-15 minutes. 2- I hate soggy salad. I also hate wasting food. So, here is another great tip. If you have accidentally put on too much salad dressing, put the salad through the salad spinner. Now you have a less soggy salad and you can dump that salad dressing right back into the jar. Beautiful! 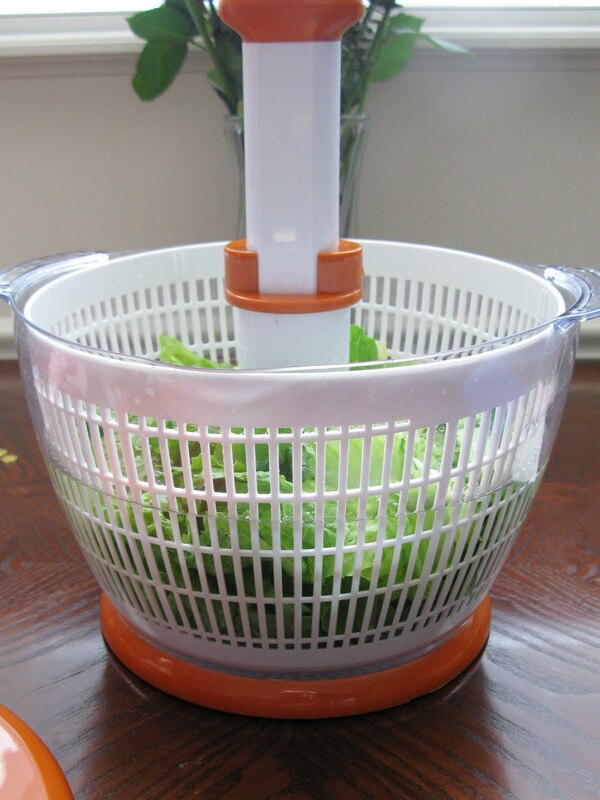 Do you have any salad spinner tips? I love my salad spinner too! I haven't used it lately thanks for the tips. I have used it to clean bok choy fill it water then pour out the water with dirt and spin. Until you own a salad spinner, you don't know what you're missing--and you're missing A LOT! I love my spinner and use it all the time. I combine it with these cool food saver containers from Tupperware. I chop my lettuce (with one of those plastic knives so it doesn't turn pink), rinse and spin and throw it in there. The lettuce lasts a long time! Same for spinach. These tips you gave are great--I never would have thought of spinning off salad dressing! Do you mind me asking what brand yours is/where to purchase? Jennifer - I got mine at Costco, it is a KitchenAid brand. I had OXO before and really like that one too. Ok I am finally going to try it! I don't get it yet but I bet I will!